It seems this sleepy midwestern all-american town has become infested with the stumbling undead . Sure, they are slow and stupid, but there are a lot (A LOT!) of them, and only one of you. Right now you are at the town square, you are pretty sure there is a helicopter around here somewhere, but where? 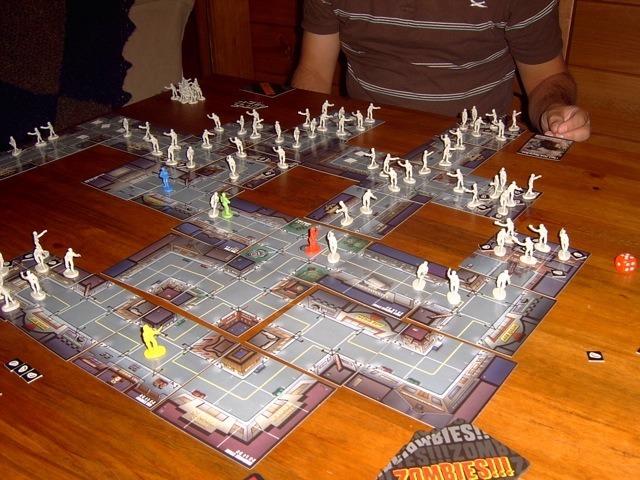 Plenty of zombies lie between Mr Yellowman and the helipad at the far edge of the table! ZOMBIES!!! is a simple board game for 2 to 6 players that pits you against an army of the town's former residents resurrected in zombie form. Every turn you turn a map tile place up and place it next to an existing piece of the map. Most of the tiles are simple roads or intersections, but some contain buildings (a hospital or sporting goods store) that may contain useful items. In either case, you can be sure they are crawling with enemies. Eventually the heli-pad tile will show up, and then it is a race to get there first and fly to some offshore island and wait for the zombies to rot where they stand. Along the way you fight the zombies with various weapons and play cards the either help you along or hinder the other humans' plans. The actual gameplay of ZOMBIES!!! is ridiculously simple, almost to the point of stupidity. Movement is a simple 6 sided dice roll; combat (which is very frequent) is the same, which a roll of 4 or more being victory. Various cards can be played to change the outcome of battles, help move you (or other players) around, or add more zombies to the map. Each turn is pretty quick and the game moves fairly fast. Tonight's game involved 4 players and ended unusually in that 3 of the players managed to be in the helicopter when it took of, while the other player just missed out on the alternate winning condition of killing 25 zombies. The other games I have played have been a little lopsided. Floating around on the internet somewhere there is an alternate set of rules that look like they may make for a more interesting game, but I haven't tried them yet. As it is, I am not sure ZOMBIES!!! really deserves all those capital letters and that third exclamation mark. I can only recommended this game for people who really like zombie-related media.